For as long as I can remember, scent has always been a finishing detail. I clean my apartment and a great candle seals the deal. If I’m entertaining, I want something fragrant to welcome my guests. And if I’m getting dressed for any occasion, even the most mundane, I’m spritzing something on me. To that latter point, I present today’s group post – my scent colleagues, Candy Boy Perfume, Eyelineronacat, Olfactoria’s travels, Persolaise and I are pairing fashion with scents. 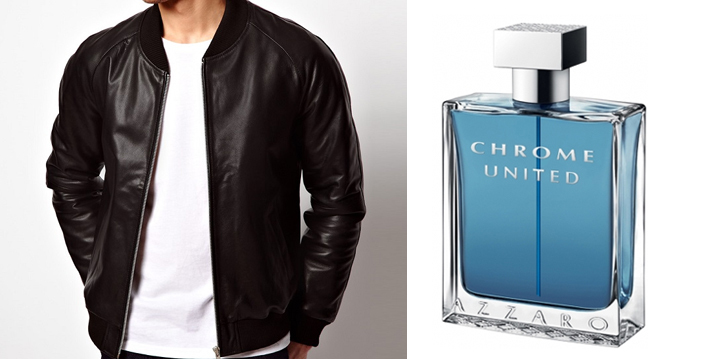 What follows are a few looks I’ve pulled from around the web and imagined its ideal scent. I love a good “white pants” look and Sabir from mensstylepro.com does it well. Pairing it with a chambray shirt and safari jacket this simple but chic get up will have him standing out in the crowd for sure. 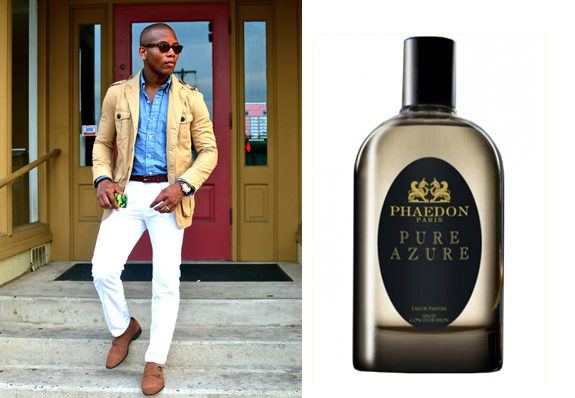 That said, an accompanying scent need not compete and I think Phaedon’s Pure Azure would suit this look well. Clean without being overly soapy, Pure Azure starts out with a burst of fig and the sweetness of orange blossom. It has an airy quality and I like it for those perfect days when the sun is beaming and a constant breeze keeps you inside. By the time it begins to dry down and the warmth of the vanilla and tonka beans present themselves, don’t be surprised if she seems to be getting closer. I love color as it brings life to anything, especially when it pops. That’s probably why this look from Seize Sur Vingt jumped off the page at me. Sure a dark blazer with a light colored bottom screams preppy but paired with this plaid shirt and it’s beautiful use of orange, this look is quickly remixed and updated. For that I’d have to pair this with something from Thirdman’s collection. I love how they have flipped citrus-based scents and given them new life. 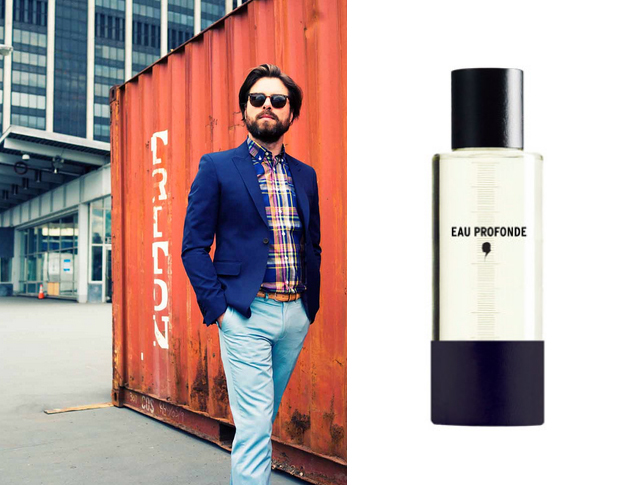 For this look, I’d choose Eau Profonde. Light and airy, it opens with a fresh new take on amber. It’s gorgeously refreshing. What I love most is that beautiful opening will be with you at the end of the day. That tie and pocket square does wonders for this blue suit. The look is fresh and modern. Is he a banker or an ad exec? Who care…he’s sharp and deserves a modern man’s scent – Ormonde Man. 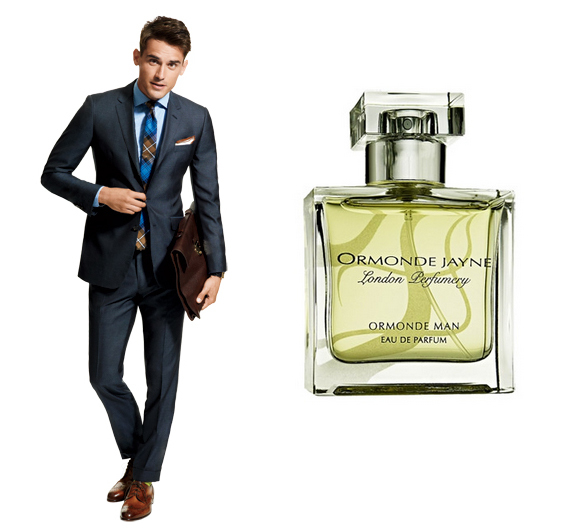 Beautifully masculine without the old world bravado, this scent is rich and subtle, possesses touches of sweetness and moments of spice in unexpected ways. It’s fantastic from open to close and gets better as the day gets older. Understated but chic. Rugged but clean. It just works. That’s how I feel about Azzaro Chrome United. Check out how the rest of the crew paired their fashion + scents – Candy Boy Perfume, Eyelineronacat, Olfactoria’s Travel and Persolaise.